Identify your passion. Create a plan. FloForward into your dream career. 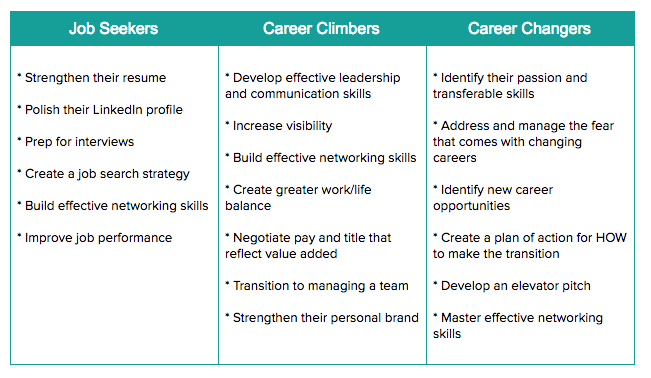 The job seekers, career climbers and career changers I’ve worked with range from entry-level to middle management across a variety of industries such as marketing/advertising/sales, media & entertainment, tech, consulting, higher education, healthcare and law. My client-coach relationship is truly a partnership. We both do the work. I’ll give you a safe space to share what’s going on in your world, and help you recognize your strengths and weaknesses, what excites you, and definitely what annoys you. I’ll ask thought-provoking questions and share my unbiased advice, helping you see another perspective. I’ll help you envision what your life would look like if you were happy and fulfilled in your career. Having a vision is just the start and living out that vision is where we aim to finish. I’ll do this by meeting with you one-on-one, getting an understanding what you want to achieve as well as the challenges and obstacles holding you back. And together we’ll develop a plan of action to turn that vision into a reality. Working with me isn’t a one-size fits all approach. The action plan is not a template. It’s a plan that’s created based on your specific needs. Check out my story here if you want to know more about me and my career journey.